Samson/Daft/Donnet's Management is a robust foundation text providing a balance of broad, theoretical content with an engaging, easy-to-understand writing style. 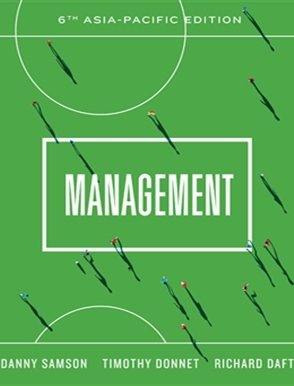 It covers the four key management functions - planning, organising, leading and controlling - conveying to students the elements of a manager's working day. Along with current management theory and practice, the authors integrate coverage of innovation, entrepreneurship, agile workplaces, social media and new technology throughout. This sixth edition features a new author on the team and contains updates to content based on recent research. Real-life local and international examples showcase the ongoing changes in the management world. Focusing on a 'skills approach', they bring concepts to life for students, supporting motivation, confidence and mastery. Each part concludes with a contemporary continuing case study, focusing on car company Toyota as it faces managerial challenges and opportunities in the region.